This is a simple editor for animation.hkx. I made it for the purpose of fine adjustment of existing pose. hkxPoser uses Havok(R). (C) Copyright 1999-2008 Havok.com Inc. (and its Licensors). All Rights Reserved. See www.havok.com for details. Copy your favorite nif models (.nif) into data\meshes folder. Copy diffuse textures (.dds) into data\textures folder. subfolders are not needed. 3. Drop any animation file (.hkx) onto the screen. Click on a round marker to select a bone. The selected bone will turn red. You can operate the selected bone. Hold down any of the XYZ buttons and move the mouse. Then the selected bone moves and rotates. Open the existing .hkx file. 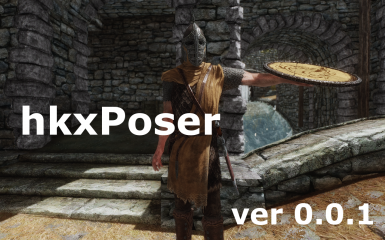 Save the created pose as an .hkx file. - annotations must be remained. - Allow to drop .hkx file to load. - Change Skeleton Rig to XPMSE 3.94 BBP. - Switch to Direct3D11 + Direct2D1. - Restriction: Currently apply the patch in one frame to all frames.